GE PTWN8055MMS Profile Harmony SeriesTop-Load Washer 5.2 cu. ft. 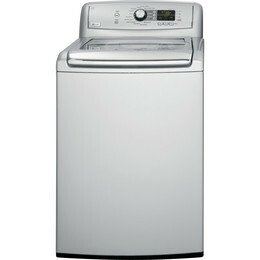 The PTWN8055MMS is an Energy Star qualified and CEE Tier III rated washer manufactured by GE. With this federal certification, you are assured that this washer is an energy efficient machine, and can incur you savings on utility bills. It is equipped with a Flow-Thru Dispensing System that releases cleaning solutions, including bleach, liquid or powder detergent, pre-treat solution and fabric condition at the right time during the cycle and the right amount for optimal washing. As it is a model of GE profile washers, brand new units carry a lifetime warranty on the stainless tub and a 10-year limited warranty on parts. TidalWave wash system, which is a combination of Infusor mechanism, centrifusion and waves of water that aids in the proper flow of water and detergent through the items to ensure a gentle yet thorough cleaning of each item. Moreover, it also has a built-in water heater called the HydroHeater with Sanitize option. By using water in high temperatures, common bacteria are eliminated and tougher stains are broken down. 7 built-in cycles: One such cycle is the Speed Wash option which gives you the chance to quickly was lightly soiled items, finishing the wash fast if you are in a hurry or if you need to have that item ASAP. It also includes a soak option that softens hard to remove stains, a cycle that a lot of long-time washing machine users have gotten used to and expect in their washer. QuietClose glass lid. M/B> It features an extra-wide opening for you to reach down and grab items inside without difficulty. The glass lid allows you a clear view of what is happening inside the machine even when it is in use. With the hydraulic tension in the glass lid, you wouldn’t need to exert too much effort in opening and closing it, as it will close and open with minimal effort. The controls are located in a raised panel behind the glass lid. A interesting control feature is the My Cycles option, which allows you to use the cycle that you usually have or to help you remember the cycle for specific loads. Overall capacity: 5.2 cu. ft. There are 7 wash cycles in this model, including Sanitize, Washable Wools, Speed Wash, Rinse and Spin, My Cycle, Soak and 2nd Rinse for you to choose from depending on your load or preference. The washer options and settings included in this model are Extra Rinse, a Delay Start option and Fabric Softener. The Timed Flow-Thru mechanism include one each for detergent (liquid or powder), bleach and fabric softener for precisely-measured and timely dispensing of these laundry implements. There are 5 wash and rinse temperatures built-in in the machine for proper water temperature during washing and rinsing. The top load nature of this machine makes it impossible for the top portion of machine to be used as extra surface or stacking space. This model does not include any steam features.